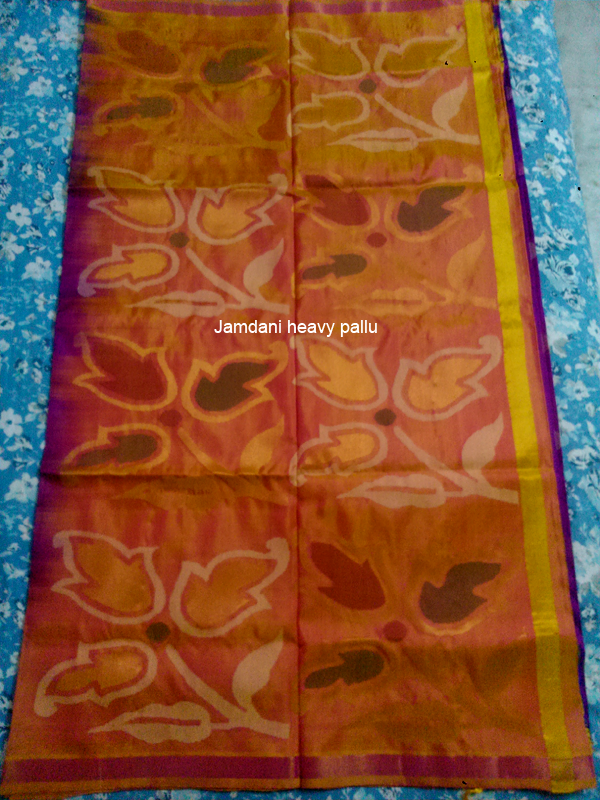 You can find various type of Uppada silk/pattu sarees in UppadaPattu shop in Etsy.com, jamdani, jamdani plain sarees and Mangalagiri cotton sarees etc..
Generally few of question are asking customer while i am dealing with them about Uppada saree. Why Uppada sarees has bright colors? Why huge contrast colors are using for Uppada sarees? So many people are asking about these questions. The answer is simple, Forefathers of Uppada are use to dyeing contrast colors and present generation continue to their footsteps. around 100 to 200 family's are working on dyeing to silk everyday but there is no connection between one another each. but we can find unique contrast/bright colors around Uppada. And they have feel that having a unique identification with contrast colors. and you never find dull colors or soft colors in Uppada silk sarees. 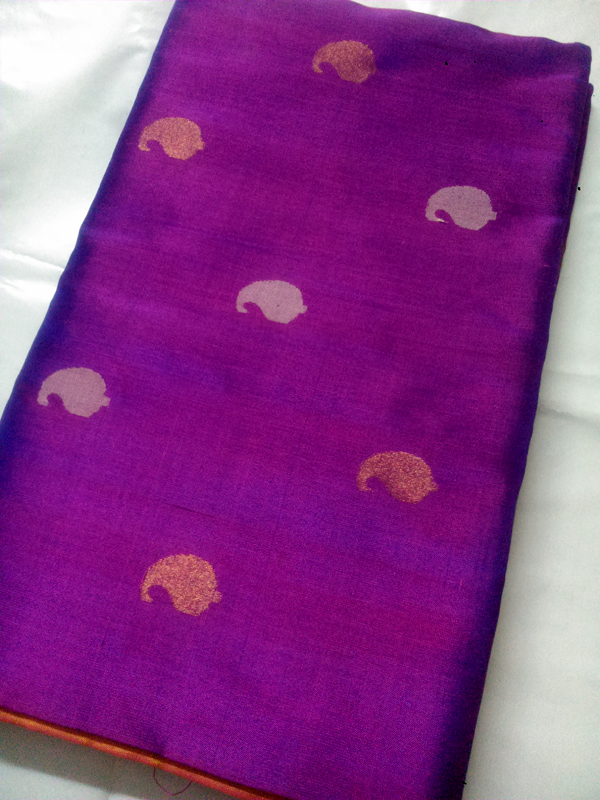 Gadwal Snuff Color Sico saree, you can get in Kaushi Collections. We can find different color shades in Gadwal sarees as well as rare color combination.This picture taken from Kaushi Collections and You can find more designs from these people. 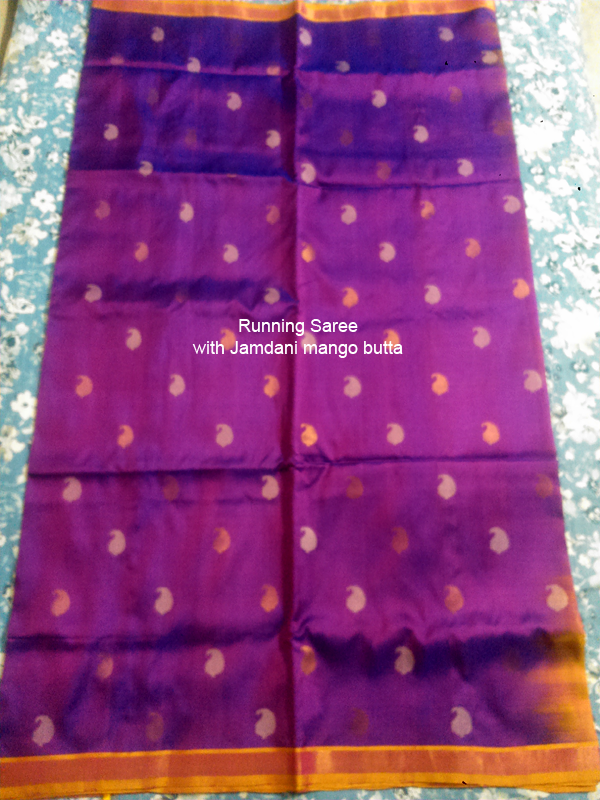 You can find various type of Uppada silk/pattu sarees in Kaushi collections, jamdani, jamdani plain sarees, Sico and Chanderi silk etc..
Price is low and you can get shipping around the world. 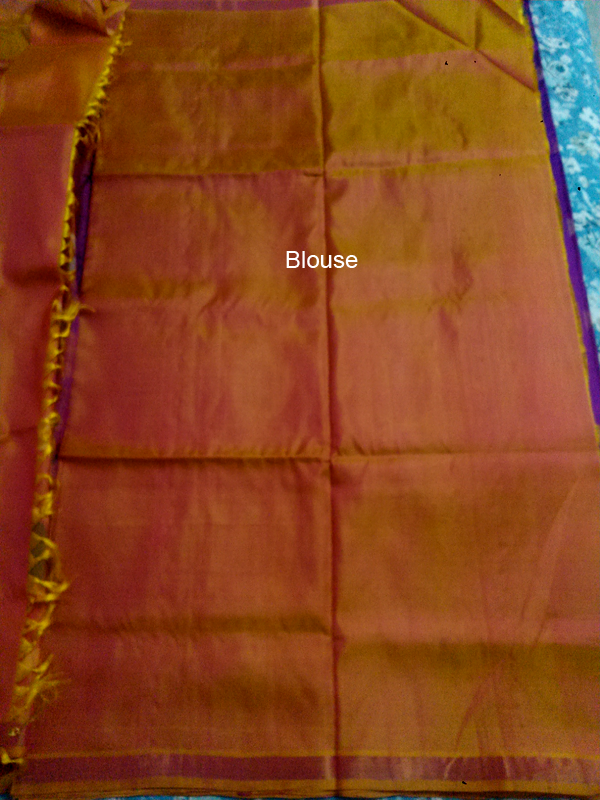 Off and off Uppada saree white color with pink checks, small zari border. Uppada Weavers uses the ancient technique called the jamdhani weaving technique and it is non-technical. The origin of Jamdhani weaving is Bengali. The count used in Uppada Saree is 100 length and 120 breath and it gives softness and hardness of the fabric, made in cotton like wrap and wept . 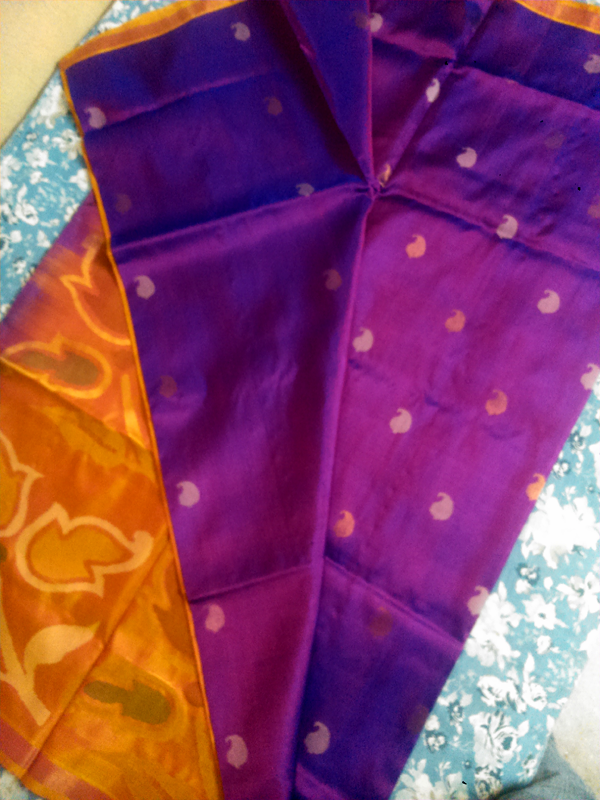 To create motif(design patterns) on Uppada Saree is complex and it takes time and grasp amount of patience. 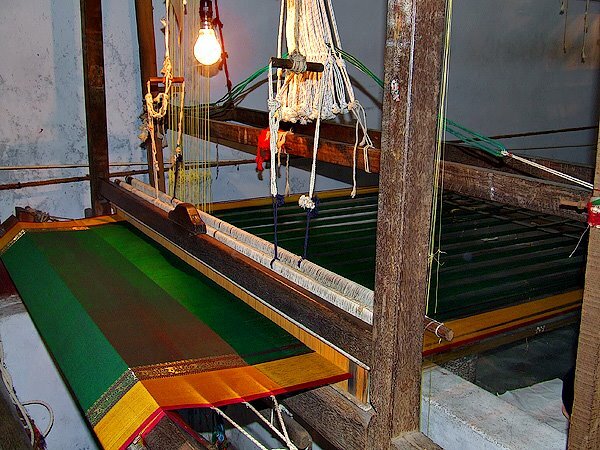 Weavers are woven the Saree on handmade machine (Maggamu).The design pattern which is used on the Saree drawn on paper is fixed under the warp threads and as the weaving starts. The designs are worked in like embroidery. The weft thread come nearer to the inserted design drawn paper, the weaver kept kande(roll of thread on a bamboo stick) on handmade machine(Maggamu in Telugu). The crosswise weft thread that fill the warp thread in weaving. weaver sews down the inserted portion of the design with needle and continues till the pattern is completed.